In 1964 Norton was considering replacing its overhead valve twins, which were beginning to show their age. The Plumstead factory - also part of the Associated Motor Cycles group - was given the job of developing a new twin. Developed first as a 750, then as an .800cc under the code name "P10," this prototype was intended for minimum maintenance. It had a unit-construction engine and twin overhead camshafts. A single chain running inside a triangle of narrow tubes lined with anti-friction material drove both overhead camshafts before returning to the crankcase by a tortuous route in which it also drove the magdyno unit. Two further chains formed the primary and secondary drives. Despite long trials, the P10 failed; excessive vibration forced the use of flexible engine mounts. 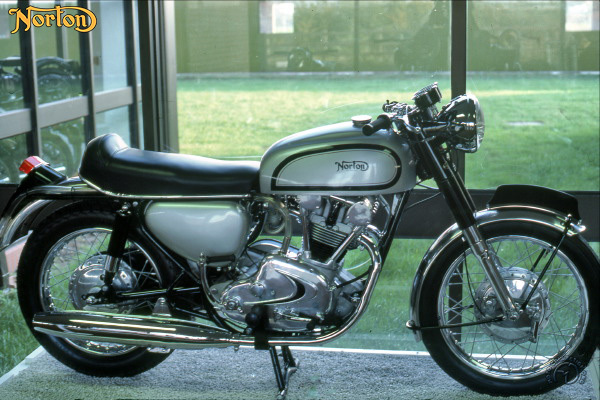 When Norton regained its independence, it decided to cut its losses and, lacking other means, initiated a design study based on the old Atlas engine. This became the famed Commando, which used the excellent Isolastic mounting of the engine/ gearbox unit to eliminate the vibration problem. Twin overhead camshafts, unit construction ofengine and gearbox, and five speeds - the P10 promised much but was found wanting.